Proactively identify, assess, and address risks across your bank. Quantivate ERM Software for Banks enables your organization to improve the effectiveness of its risk assessment and mitigation programs and lower loss rates. The application deeply integrates with other key GRC software solutions, giving management greater access to information for strategic, enterprise-wide decision-making. 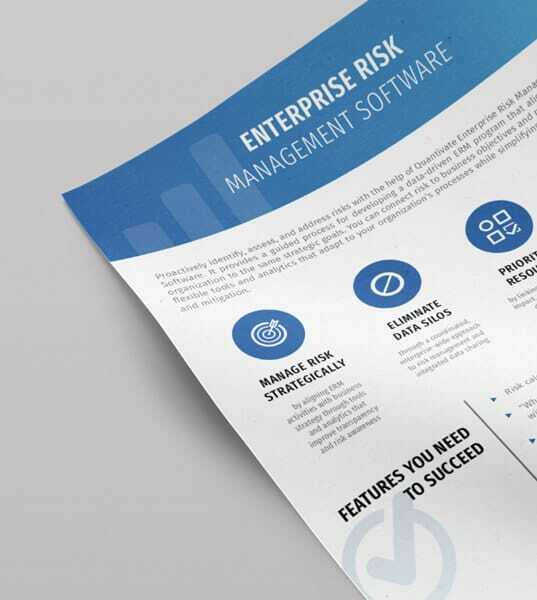 Quantivate Enterprise Risk Management will help your organization create a culture of increased risk awareness — reducing risks while lowering costs. It provides a guided process for developing a data-driven ERM program that aligns your entire organization to the same strategic goals. You can connect risk to business objectives and performance with flexible tools and analytics that adapt to your organization’s processes while simplifying risk management and mitigation. Many organizations don’t have the time, resources, or knowledge to complete the risk management processes that may be necessary to meet regulatory requirements. That’s where Quantivate Enterprise Risk Management Services come in. Our ERM service offerings go beyond just a software solution. We combine our award-winning software with ERM consulting services to provide you with a complete solution featuring both proprietary technology and industry expertise.